Even as I continue my quest for healthy food alternatives, I think back fondly to my high school years, when I would eat an Entenmann’s chocolate-covered donut almost everyday. I would wash it down with some whole milk and a small bag of potato chips — a very healthy meal! I eventually moved on to the coconut-covered chocolate donut from Dunkin Donuts. All I knew was, it tasted good. But these days I have other priorities. And while I was looking for information on donuts, I found out it has a whopping 340 calories. Oh my, I think I gained a few pounds just doing the research. For, in fact, while I was one bite away from a 12-step program for donut addicts in my youth, I now can’t remember the last time I indulged in a donut — or should I say doughnut? Last year I was at the The Mall at Short Hills with a friend and we came upon a bakery called Brownie Points, with delicious-looking cupcakes, cakes and brownies. It looked very appetizing and clean. I bought a cupcake for my daughter to take home. While we were paying, we looked over to a table covered with round, muffin-like confections. We were curious, so took a few steps closer. And that’s when I met my first “duffin” — a cross between a donut and a muffin. And they’re baked. Well, it did not take long before the old donut desire got the best of me, and we were sitting down with a cinnamon-sugar duffin. It was heavenly. Similar to a pound cake but lighter, it was not too sweet. We played it cool, saying we might come back again and indulge every once in a while — but, O.K., maybe more often than that. A few weeks ago, I found out the bakery had left the mall. How disappointing. How will I satisfy my newly formed duffin desire? Once I get something in my head, especially if it is food related, it doesn’t leave me until I resolve it. The same thing happened with the duffins. I began an extensive search on the Internet. I was thrilled to find a recipe for it, which I then tweaked to my taste to make it my own. I used white whole-wheat flour, raw sugar and added a bit of almond extract in addition to the called-for vanilla extract. Delicious. But also very healthy. They have just a quarter cup of extra light olive oil. I sat down and indulged in a duffin with some hot coffee. It brought me back to those unhealthy donut days. I am planning on baking a chocolate and a jelly-filled one in the next few weeks. Stay tuned for it on my blog. Preheat oven to 350 degrees F. Lightly grease a 12-muffin tin with a bit of oil in each cup. In a large bowl, beat together sugar and egg till light and fluffy. Pour in vegetable oil, milk, vanilla and almond extracts. Mix to combine. In a small bowl, sift the flour, baking powder and salt. Pour into the egg mixture and stir well. Divide batter evenly into the muffin cups, filling about half full. Bake for 15 minutes, until a tester inserted into the center comes out clean. While muffins are baking, melt butter in a small bowl. Pour half cup sugar and cinnamon into another small bowl and mix well. 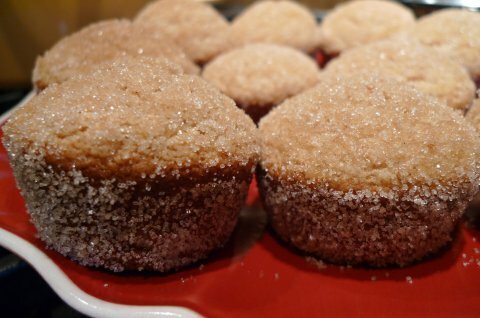 Once the muffins are done, lightly brush the top with melted butter, remove from the pan and roll in the cinnamon sugar, coating all parts of the duffin. Monica Puri Bangia is a mother and wife who loves to cook and entertain — but most of all, cook. She writes adaily food blog that highlights healthy recipes that are easy to make and kid-friendly. She is also cooking coach and teacher, providing cooking classes in her client’ homes and teaching about her native Indian cuisine at the Adult School. She also writes for a variety of other blogs and magazines — all about food, of course. Monica Puri BangiaBurger and fries, hold the cholesterol and pour on the vitamins. Monica Puri Bangia is a mother and wife who loves to cook and entertain — but most of all, cook. She writes adaily food blog that highlights healthy recipes that are easy to make and kid-friendly. She is also cooking coach and teacher, providing cooking classes in her client’ homes and teaching about her native Indian cuisine at theAdult School. She also writes for a variety of other blogs and magazines — all about food, of course. How do you feel about reinventing a classic meal? If you had asked me this question years ago, I would have preferred the classic. Just eat it less often, I thought. Why toy with perfection? Now I am older and my perspective on things have changed. My priority is eating healthy. So if you can tinker with a classic dish to make it less loaded with all the foods I want to avoid — why not? My concerns these days are with weight (not gaining it) and health (enhancing it). That means a myriad of things we need to eat — fruit and vegetable requirements; protein and fiber — must be incorporated into our daily diets. I also feel it is very important to teach my daughter healthy eating habits she can use for a lifetime. To do that, I try to incorporate different kinds of vegetables in a well-balanced meal consisting of a good protein and a healthy starch. But that can be very challenging, especially when there are so many options for eating out or buying prepared foods. We do eat out as a family, but only at places where I trust the food quality. After watching Food Inc., I have become very careful about what I buy and where we eat. So I took on a classic as a healthy eating challenge. As an experiment, I decided to make hamburger and fries in a completely different way — one that would pass my healthy-eating muster. I gave it an Indian twist. For the hamburger meat, I used ground turkey and followed a seekh kebab recipe. Seekh kebabs are made out of spiced minced meat — typically lamb or goat. I used dark meat turkey to ensure tender burgers. I bought whole-wheat buns instead of the regular ones. I also made a cilantro chutneyand bought tomato chutney (from Trader Joe’s). Doing so reduced a lot of calories and made the dish healthier. I wasn’t done yet. Instead of using lettuce and tomatoes, I decided to caramelize onions and zucchini as a topping. Don’t get me wrong: I love going our local pub in Maplewood to eat a burger with fries. The best part of that meal is the thick-cut potatoes called chips in the U.K. I finish every single one on my plate. But to make my meal healthier, I decided to use sweet potatoes instead of regular ones. Sweet potatoes are an excellent source of Vitamins B, C and E. They are low in sugar and high in fiber. I cut them up as regular fries and added extra virgin olive oil, garlic powder, salt and my favorite spice, smoked paprika; it provides a mouthful of flavor — very smoky and distinct — and complements the sweet flavor of the potatoes really well. So my family got a classic meal — and I came away with pride that I had been able to provide it to them in a healthy, lower-calorie way. Try it out and let me know what you think. Moral of the story: Eating well does not mean it has to taste like cardboard. P.S: Stay tuned for a healthy donut recipe in my next post. Yes, you read it correctly: healthy donuts! Heat a grill pan and add one tablespoon oil. Add 4 patties at a time and cook till golden brown on both sides. Cook about 4 minutes on each side. Keep warm. Heat a non-stick frying pan with one tablespoon oil. Brown the zucchini slices on both side till golden brown. Sprinkle salt. Keep aside and add the remaining oil and add the sliced onions. Saute on a low heat till the onions are soft, and sprinkle salt. Mix the cooked zucchini and onion and keep aside. 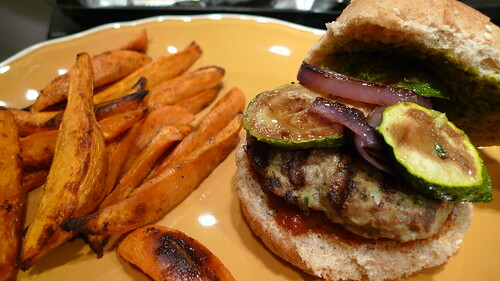 To assemble the hamburgers, spread the cilantro and tomato chutney on either sides of a bun. Place a patty on one side and top with zucchini and onion. Serve with sweet potato fries. Place the fries on an aluminum foil lined cookie sheet. Drizzle the olive oil, salt, garlic powder and paprika. Mix well with your fingers and bake for about 45 minutes or till the fries are soft on the inside and crunchy and golden brown on the outside.